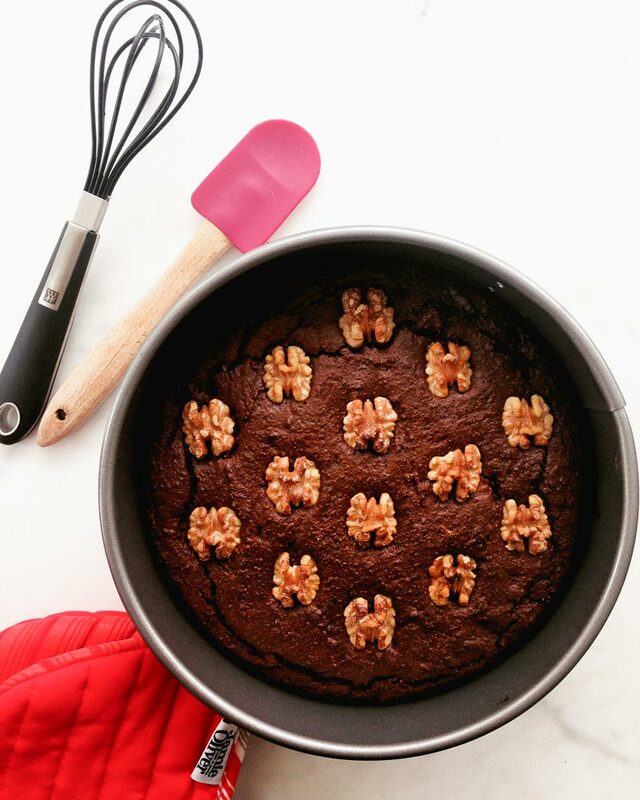 Inside Scoop: This Easy Chocolate Beetroot Cake is the healthiest double chocolate cake you’ll ever have. Sweet, earthy, an acquired taste, and they’ll probably temporarily stain your hands when you cook with them- beets are completely under-rated, and definitely undervalued as a superfood. Maybe, because they’re perceived one way (the opposite of delicious), or maybe because they take some time to cook… let us assure you, the magical beetroot needs to be a staple in your diet. We’re not trying to be bossy. If you don’t like beets, you don’t like beets and we can’t change your mind… or… can we? Lowering the risk of heart disease. Don’t freak out about having ‘red’ or ‘pink’ urine or stool, the pigment betalain found in beets cause this in approximately 14% of the people. It’s kinda cool though! And, if you want to ‘beet’ that unfriendly gut bacteria (ya, ya we went there), arabino-oligosaccharides found in beets act as prebiotics; meaning they provide food and nourishment to your friendly gut bacteria. Having your gut bacteria in a happy, healthy place is a must if you want: increased energy, healthier skin, better mood, healthy weight, and all in all, better health. We won’t be the first to admit this, but neither one of us were big fans of beets to start. And to be completely honest, we’re not fans of most plain vegetables, but there’s something so appetizing about a bed of arugula, with garlic roasted beets, dressed up with a balsamic reduction, goat cheese and topped with some walnuts or pumpkin seeds. The distinct flavours of an otherwise seemingly boring food can be amplified when it’s cooked and seasoned in the right way. These days, beets have become a weekly staple and we incorporate them into almost everything we cook. You can stew them, add them to salads, eat them raw, make a beet hummus, pickle them, add them to sandwiches, burgers, and believe it or not, one of our favourite methods of using beets in the kitchen: in our baked goods. 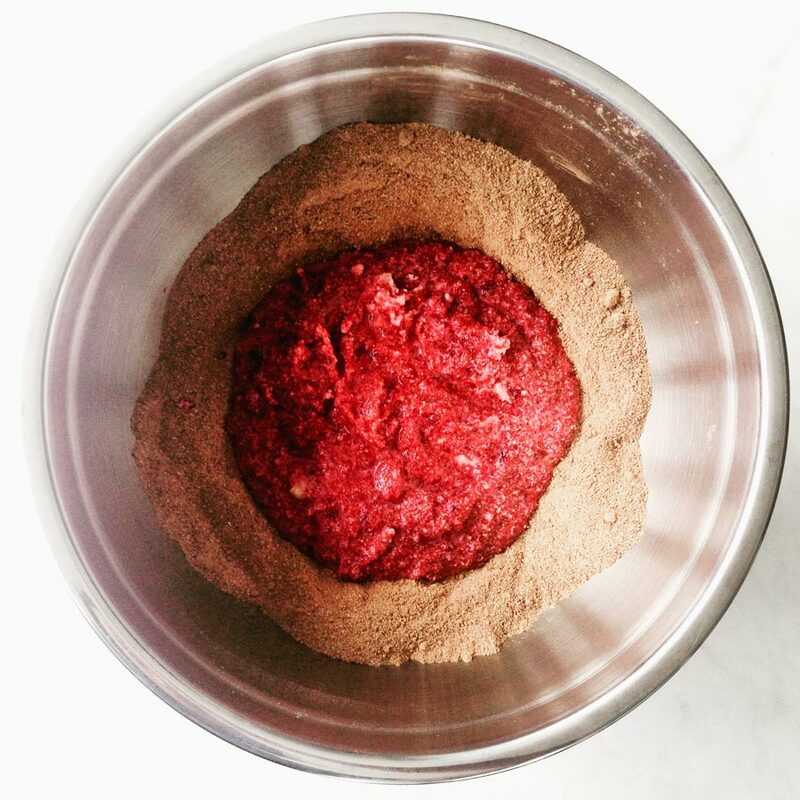 Raw cakes, cupcakes, chocolate, cookies, ice cream…you name it, you want to bake with a beet? When there’s a will, there’s a way! And who needs food coloring when you have some beet juice? So, now that we’ve rambled on about some awesome beet treats, and why choosing the beetroot is amazing for your health, we have a little treat of our own for you. 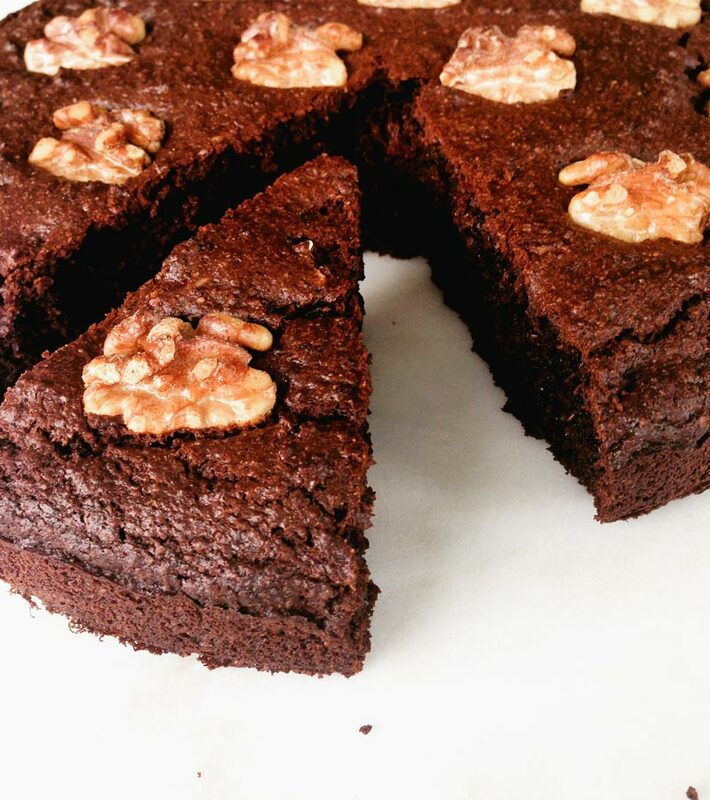 Chocolate, on top of chocolate, with beets, mixed into a cake, our This Easy Chocolate Beetroot Cake. The amazing thing about this chocolate beet cake is that the beets make the cake incredibly moist, and they bring out the intense taste of chocolate. It’s a match made in pure deliciousness, chocolate heaven! 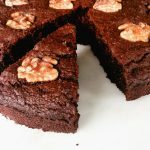 What’s the best thing to top Chocolate Beetroot Cake With? The obvious not-so-obvious answer is this Sweet Potato Chocolate Frosting. Our mission is to hide veggies in everything incase you can’t tell already! What’s your favourite way to eat beets? Comment below. 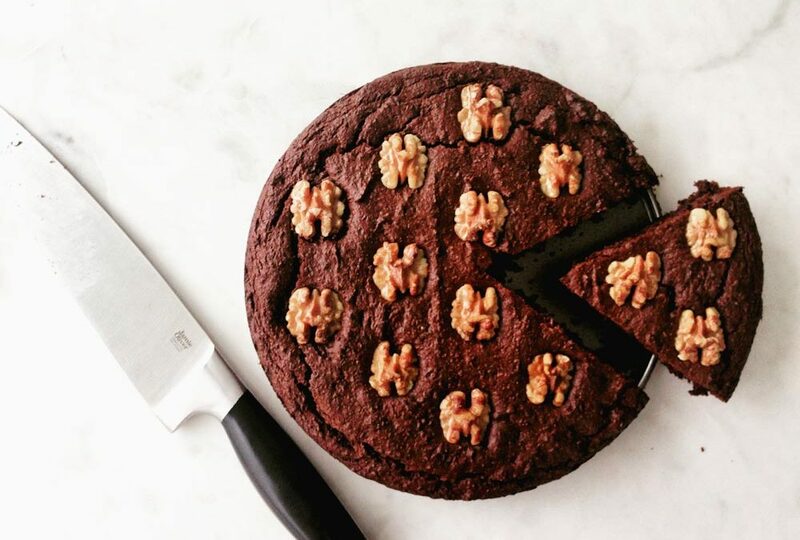 This delicious and nutritious Double Dark Chocolate Beetroot Cake is the perfect alternative to the sugar heavy chocolate cake. Jam packed with healthy ingredients, but tastes unbelievably delish! * Combine 1 Tbsp milled flaxseeds with 3 Tbsp water. Place in fridge for 10-15 minutes until a gelatinous mixture forms. ** To make this cake in no time, simply use vacuum packed boiled beets. They are readily available in the grocery store. Make sure the only ingredient on the label is beets. Whisk eggs + flax egg with vanilla extract. Add coconut oil and pureed beets and whisk to combine. Pour the wet beet mix into the dry mix and stir to form the batter. Fold in chopped walnuts and chocolate chips (optional). Coat a 9 inch springform pan with coconut oil. Pour batter into pan and if you like decorate with walnut halves on top. Bake for 40-50 minutes, or until a toothpick is inserted into the center and comes out clean. Allow it to cool and then add glaze or cream (optional). Keep it light: eat as is and use walnut halves for decoration. Creamy & moist: make coconut whipped cream by scooping the cream from the top of a full fat coconut milk can (do not shake the can). Whip the cream with a hand mixer and 1 tablespoon cane sugar or maple syrup and 1/2 teaspoon vanilla extract. Make it triple chocolate with the Sweet Potato Chocolate Frosting shown above. Allow to cool and glaze the cake. Thank you!! Exactly the little bit of naughtiness I need every now and again and I’m bonkers about beets 🙂 Love love love it. Good job! Can I share on my FB page?? Enjoy it Jacqueline 🙂 and yes, share away! Great question! A flax egg can be used as an egg replacement when you combine 1 Tbsp ground flax with 3 Tbsp water you let it sit for 10-15 minutes. It forms a gelatinous mixture to help with binding like eggs. You can see the description as well in the recipe directions. Thank you for this delicious recipe I will try this at home. I’m a huge fan of cinnamon rolls recipe.